On November 4th, Young Kim was elected to the State Assembly to represent the 65th State Assembly District. 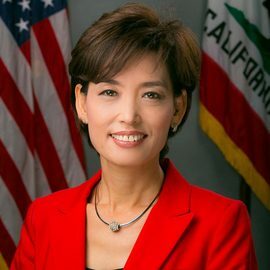 She is the first Korean American Republican Woman ever to serve in the California state legislature, and the first Asian American to represent the cities of the 65th Assembly District in Sacramento. Currently, Young Kim serves as the Vice-Chair of the Committee on Jobs, Economic Development, and the Economy. She also serves on the Banking and Finance Committee, Budget Committee, Education Committee, Transportation Committee, and Budget Subcommittee No. 2 on Education Finance. She is focused on working to create a better environment where small businesses can succeed, bringing jobs back to California, and creating an educational environment where every child can have a quality education. Prior to serving in the State Assembly, Young Kim was a long time community leader in North Orange County with unique private and public sector experience that makes her an ideal representative for the 65th district. She worked as Director of Community Relations and Asian Affairs for Rep. Ed Royce, where she served as a key liaison to the local communities within Rep. Royce’s congressional district, advised Royce on issues pertaining to the Asian community, and developed strategic plans to keep the community informed of Royce’s legislative priorities on both domestic and foreign affairs. In the private sector, she’s been a businesswoman, financial analyst and controller. She worked as a Financial Analyst at a southern California Bank and Controller for a southern California manufacturing company. In 2013, Young Kim reformed a business she had owned and operated nearly 20 years earlier, YK Connections. Young is also a well-known Television Talk Show Host, having hosted “LA Seoul with Young Kim” on KSCI-LA 18 from 1998 to 2005 and “Real Talk” on Arirang-TV in 2011. In addition, she provided weekly commentaries discussing current affairs on Radio Seoul which is a 24-hour Korean radio station. Young Kim has also been actively involved in numerous local organizations, including the World Affairs Council of Orange County, International Leadership Foundation, California Women’s Leadership Association, Fullerton Public Library Foundation, Korean American Federation of Orange County, Korean American Coalition of Orange County, and most proudly as a Working Mom and Spouse. A resident of Fullerton, Young is married to Charles Kim who is a Founder and former National President of the Korean American Coalition. They are the proud parents of four children (ages 28, 25, 23, and 20) who attended or currently attend Fullerton’s public schools.